Using a Cafeteria Approach to Negotiate the Best Pro-Landlord Operating Cost Provisions the Market Will Allow, The Anatomy of the Landlord’s Bare Bones Operating Cost Clause, and the Lease Clause Critique: Five Devices To Tighten Up the Landlord’s Bare Bones Operating Cost Clause When the Market Permits. Vacancy rates are falling in some markets, and there's nothing like stronger demand to make landlords think about toughening up their form leases. Landlords in markets with high vacancy rates have had little opportunity to do that in the last few years. They have had to settle for eviscerated operating cost or CAM clauses in their lease forms, particularly when negotiating with major tenants. Such watered down clauses typically provided for collection of operating costs by the landlord in general terms, but were often riddled with exceptions as to the type of costs that may be passed through to the tenant on a pro-rata basis. But as and when demand for rental space increases, landlords will have their chance to include more favorable—that is, favorable to the landlord—operating cost clauses in their form leases. 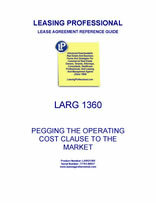 Devices strengthening the operating cost clause for the landlord could include the right to collect a management fee as an operating cost, the right to include certain capital expenditures as operating costs, limitations protecting the landlord against excessive audits of operating expenses by the tenant, and clauses of their ilk. The landlord wants the best operating cost clause in its form lease its current bargaining power will allow. How does the landlord go about getting it? And how does the landlord modify operating cost provisions in response to fluctuating vacancy rates in the market over the years? One sensible way is for the landlord to undertake a cafeteria plan analysis of the operating cost clause in its lease form. In this incremental approach, the landlord starts with a bare bones operating cost clause covering only the minimum issues for the landlord. Then, the landlord compiles a list of other contractual devices to expand its control over operating costs. The landlord picks and chooses among those additional clauses "cafeteria style" and plugs as many of them into the operating cost clause in its lease form as the market permits. If the market tightens up even more in the future, the landlord can add more of those features to its current lease form. If the market gets softer, it can take a few out. The next section contains an example of a bare bones operating cost clause a landlord might use as a starting point for its drafting exercise. Immediately thereafter, this LARG looks at five separate contractual devices which can be added to the bare bones clause to expand landlord control over operating costs. The landlord can sort through the incremental provisions, and adjust its operating cost clause to fit the current leasing market. contains serviceable definitions of real estate taxes and operating costs—such definitions are of critical importance to the landlord, since they ultimately govern precisely which items may be collected by the landlord as operating cost increases.